Ernest Henry Shackleton was born in County Kildare, Ireland on 15 February 1874, his family originally coming from Yorkshire, England. Shackleton was initiated into Navy Lodge No. 2612 (United Grand Lodge of England) on 9 July 1901. His advancement was notably slow. 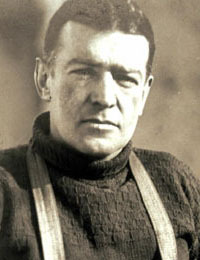 Almost immediately after his initiation Shackleton joined Captain Scotts expedition to Antarctica that aimed to be the first to reach the South Pole. Despite the expeditions failure Shackleton was inspired to lead his own expedition in 1907 that came within 97 miles of the South Pole. He was subsequently knighted in 1909. Despite appearing on many Navy Lodge summonses throughout the period, Shackleton attended the first regular meeting of Guild of Freemen Lodge No. 3525 (United Grand Lodge of England) in 1911 and was passed to the second degree by that lodge on 2 November 1911. He was raised to the degree of Master Mason at Guild of Freemen Lodge on 30 May 1913.